File photos Attorney Gardner Combs speaks on defendant Matthew Bolen’s behalf July 27. Leah Lind, her dog Willow, and supporters sit behind them. Ann Poortinga, Layh & Associates (left); Renee Pinkelman, Layh & Associates; BOCC Risk Management Director Lisa Hale; County Administrator Brandon Huddleson; Commissioner Alan Anderson; Commissioner Tom Koogler; Melissa Walters, Greene Leaf Program; Michele Cox, Women’s Recovery Center; Tom Otto, TCN Behavorial Health Services; Lori Strobl, TCN; Nathan Crago, TCN; Greta Mayer, Mental Health and Recovery Board (not pictured) and Sheriff Gene Fischer meet April 24 to discuss needs for a new jail. A dedication ceremony was held for the new veterans’ court in Greene County Common Pleas Court in November 2017. The specialized court, in action as of April 6, gives a hands-on approach to helping veterans through the criminal justice system. A series of Gazette stories chronicled three county judges’ dispute over a third courtroom in the courthouse. Health Commissioner Melissa Howell addresses a crowd during the grand opening ceremony of Greene County Public Health’s new facility Aug. 13. The Xenia Daily Gazette celebrated 150 years Aug. 18. Staff created a special Honor History section to honor the paper’s birthday and local history. The REACH Center on Progress Drive was open for hard hat tours Oct. 20. Visitors saw the building, a collaborative project with Clark State, Xenia, Kettering Health Network, the YMCA of Greater Dayton, Central State and the Adult Recreation and Services Center, which will open in January 2019. During his plea hearing Sept. 12, Dustin Merrick, 27, center, glances at a note from his attorney, Kirk McVay. Defense Attorney Gregory Meyers watches the interaction. The older Merrick pleaded guilty to murder charges following the January 2017 shootings of William “Skip” Brown and Sherri Mendenhall. He avoided the possibility of the death penalty, but will spend life in prison. 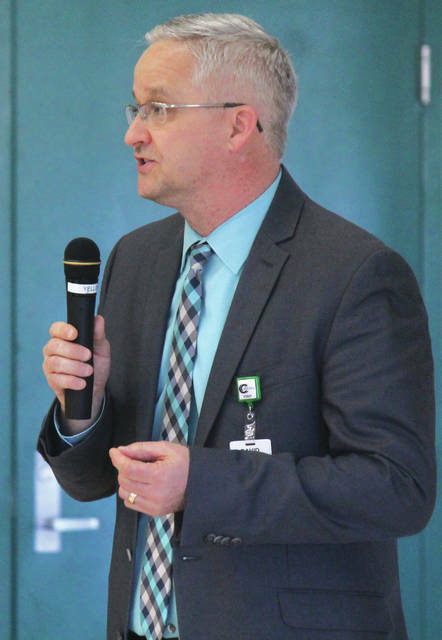 Greene County Career Center Superintendent David Deskins, pictured March 22 on campus, anticipates students to move into the new career center in August 2020. 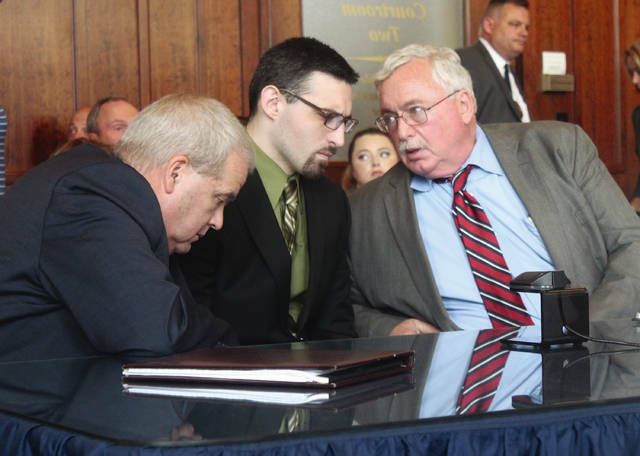 Bret Merrick, 25, center, listens to his attorneys during sentencing in Common Pleas Sept. 12. Defense Attorneys Michael Pentecost, left, and Dennis Lieberman represented him. The younger brother, who accompanied Dustin Merrick at the crime scene, pleaded guilty to involuntary manslaughter and was sentenced to 25 years in prison. GREENE COUNTY — In 2018, Xenia Daily Gazette and Fairborn Daily Herald reporters watched as buildings emerged from ceremonial shovels and dirt, covered murder cases in courtrooms, listened to local officials plan for the future, celebrated the newspaper’s sesquicentennial and witnessed a few historical milestones of the county’s own. 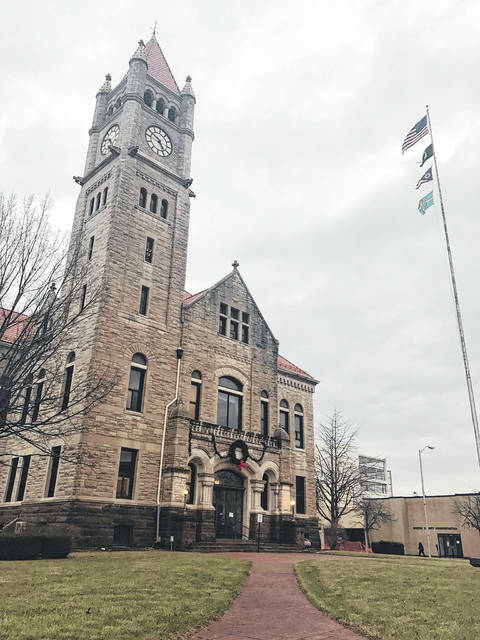 For the first time in Greene County Common Pleas Court, a man was sentenced July 27 under Goddard’s Law, a two-year-old law in Ohio at the time. The law enables prosecutors to bump up a causing serious physical harm to a companion animal charge to a fifth-degree felony. Matthew Bolen, 24 of Dayton, is serving 12 months in prison for abusing a puppy named Willow in Xenia the previous summer. A Xenia victim advocate, Leah Lind, adopted the dog. 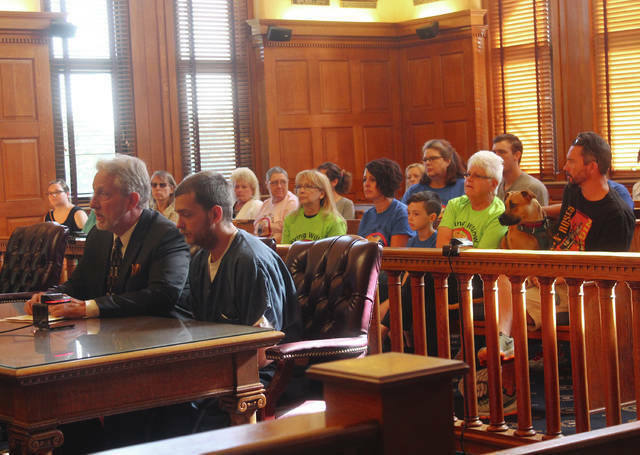 The dog and at least a dozen community members sat in the courtroom that day. Bolen’s defense attorney asked for compassion for Bolen as a human being, indicating his defendant’s long fight with an opioid addiction. Judge Stephen Wolaver, noting the defendant skipped bond twice, gave him the maximum sentence. Since January, county officials have been meeting to discuss the possibility of building a new jail. The current jail on East Market Street was built in 1969. 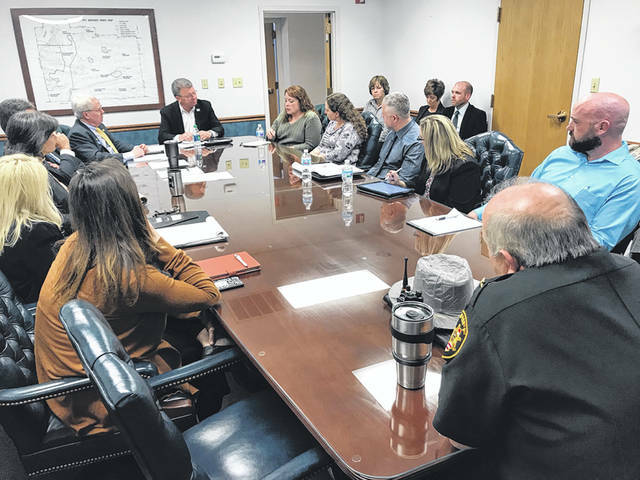 Greene County commissioners met with judges, the sheriff, jail administrator and local organization representatives to gather input on what exactly a new jail would mean, and need. Parties agreed on taking a “transformational rehabilitation” approach to the jail, stressing the importance of investing in individuals through targeted programming. Expansion of current programs and adding new programs could include, they suggested, mental health services, alcohol and drug rehab, GED classes, yoga and meditation, trade classes, recovery communities and family involvement. As part of the initial project steps, a justice consultant conducted an assessment of the current jail, which will reveal current findings and future needs. If commissioners decide to move forward and either expand the current jail or build a new facility, it could take an estimated 3 to 4 years to be considered move-in ready. Greene County Common Pleas’ veterans’ court held its inaugural session April 6, marking a historical first for the county with three men participating. The specialty court under Judge Stephen Wolaver assists veterans through the criminal justice system. When a veteran is arrested for a felony — depending on the type of crime — he or she can go through certain criteria to determine eligibility into the program. Veterans’ courts differ from general division courts. The court is entirely voluntary and the judge meets with the defendant regularly. Each veteran is assigned a local veteran mentor. Extra services are also made available to participants, whether that means transportation, housing, clothing, food, employment or treatment, through Veterans Affairs or Greene County Veterans’ Services Commission. A third courtroom in the basement of the 116-year-old county courthouse is, still, the center of a legal dispute amongst Greene County judges. Greene County commissioners received two separate, competing court orders March 5. One was from the Greene County Probate Court (Judge Thomas O’Diam), which required the board to immediately designate Courtroom 3 in the county’s courthouse as the permanent probate court courtroom, as well as pay the court’s legal fees in order to bring suit against the board. The other court order came from Common Pleas Court- General Division (Judges Stephen Wolaver and Michael Buckwalter) establishing sole and exclusive management of Courtroom 3. The board decided March 8 to construct a courtroom for the county’s probate court in the lower level of the Greene County Juvenile Court building. Probate court rejected the plan. The board stuck to its plan. Currently, probate court has a small hearing room on the first floor of the courthouse. O’Diam cited lack of adequate capacity as well as serious safety concerns for public and court personnel as reasons for the room’s inadequacies. Leading up to the court orders, parties met over the span of a year discussing the matters and possible solutions but could not come up with an agreement. The case moved to the Ohio Supreme Court. Greene County Public Health opened its new $7.8 million 28,500-square-foot facility to the public Aug. 20. Adjacent to the 42-year-old round building at 360 Wilson Drive, the shiny new facility created space for additional offices, spacious clinic rooms, up-to-date equipment and new technology capabilities. Funding for the new building came from combined funds received locally, Greene County Port Authority and Huntington Bank — not through public tax dollars or the public health levy. The first floor of the building allows access to birth and death certificate records, Women, Infants, and Children (WIC), early childhood intervention and other health programs. Upstairs houses offices for 60-plus employees. GCPH also earned accreditation for five years by the Public Health Accreditation Board (PHAB) in November. The national recognition means GCPH meets or exceeds the standards established by PHAB and is proven committed to continuous quality improvement to meet the needs of the community. 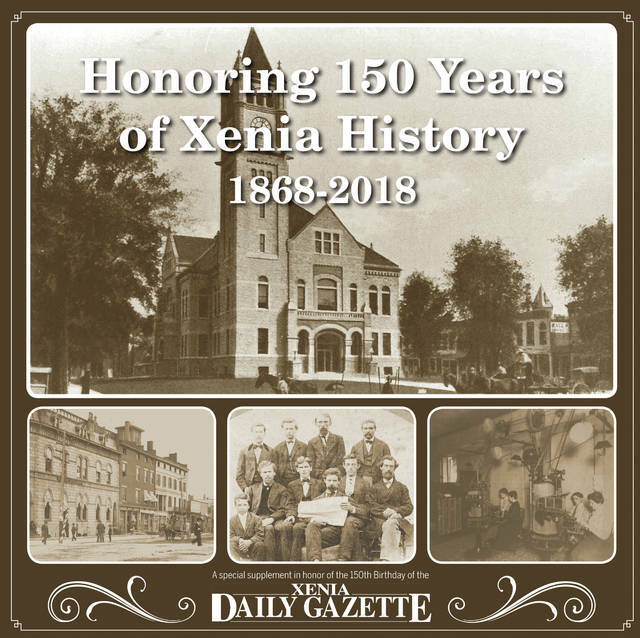 The Xenia Daily Gazette celebrated 150 years Aug. 18. In honor of that birthday, staff created a special Honor History section, celebrating 150 years of the paper as an integral part of the Greene County community and how it continues to be dedicated to providing the best local news. The 50-page special section, still available at the Gazette office, 1836 W. Park Square, shares the history of the Gazette, local businesses, notable people, and a variety of memorable events in history through stories and historical photos. The section includes stories about the three founders of the paper, how staff got the paper out to the community after the deadly 1974 tornado, the rails to trails effort and the rope making factory, and how the newspaper world is changing through technology today. The Xenia REACH Center ceremonially broke ground March 14. Recreation, Education, Activity, Community, and Health (REACH) Center construction is underway for the 75,200 square-foot facility which will be located at the corner of Progress Drive and Upper Bellbrook Road, replacing the current Xenia Adult Recreation and Services Center and Xenia YMCA. The shared building complex will also house partners Kettering Health Network, Clark State Community College and Central State University. The new YMCA will boast an aquatics center with a six-lane competition pool and a warm-water therapy pool, two gymnasiums, a suspended walking track, a fitness center, a nursery, locker rooms, a classroom space, outdoor recreational facilities and more. The center is slated to open in January 2019. 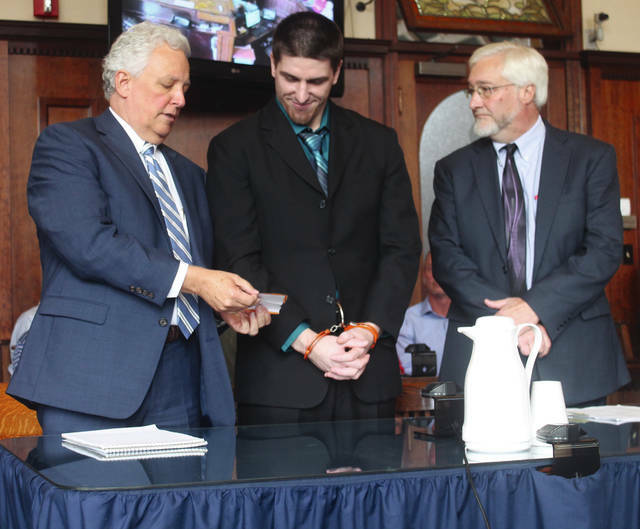 As jury selection was underway for the capital trial of Dustin Merrick, the older of two brothers accused in the Jan. 15, 2017 slayings of two Yellow Springs residents, both brothers appeared in Common Pleas to plead guilty. In a courtroom packed with family members of the late William “Skip” Brown and Sherri Mendenhall Sept. 12, Dustin Merrick, 27, pleaded guilty to two counts of aggravated murder with firearms specifications, two counts of murder, two counts of aggravated burglary, felonious assault, tampering with evidence and obstructing justice. Bret Merrick, 25, pleaded guilty to two counts of involuntary manslaughter with a firearm specification. Judge Michael Buckwalter sentenced Dustin Merrick to life imprisonment without parole, plus six years for firearms specifications, and Bret Merrick to 25 years in prison. By pleading guilty, the two avoided the risk of the death penalty. According to Prosecutor Stephen Haller, Dustin Merrick murdered Brown and Mendenhall during the early morning hours at their residence outside of Yellow Springs. He was accompanied by his brother, Bret Merrick, according to the prosecutor. While it was still dark, Dustin Merrick sneaked into Brown’s apartment and shot him to death in his bedroom, according to the prosecutor’s office. Mendenhall, in the apartment next door, woke up to the sounds of the violence. Dustin Merrick shot her in order to silence her as a potential witness, according to the prosecutor’s office. Bret Merrick, the prosecutor said, accompanied his brother and took no steps to prevent Dustin Merrick from committing the crimes. Bret Merrick apologized to the victims’ families in open court. Family members tearfully read letters to the brothers. Cedarville resident and current Attorney General Mike DeWine was elected governor in the November election. DeWine is the first Miami Valley resident elected to the state’s top spot in 100 years. DeWine is sworn in on Monday, Jan. 14, 2019. DeWine originally was challenged by current Lt. Gov. Mary Taylor and current Secretary of State Jon Husted in the Republican Primary. Before the campaign got in full swing, DeWine and Husted teamed up, forming a super ticket. They easily defeated Taylor and then pulled away from Democratic opponent Richard Cordray, winning by more than 1.5 million votes. DeWine, 71, has served as a US Senator, lieutenant governor, US Congressman, a state representative and state senator. He’s also a former Greene County prosecuting attorney. His immediate priorities include fighting the opioid crisis, putting Ohioans to work and making sure kids leave high school ready and prepared to succeed. Voters decided Nov. 6 to support a levy that will fund the construction of a new Greene County Career Center. Official results showed that more than 55 percent said yes to the levy, while more than 44 percent said no. The 20-year, 1.03-mill levy will generate $62 million for the construction of the new local career center. The GCCC Board of Education purchased 37.46 acres at the US Route 68 and the US Route 35 bypass for the proposed facility and expects a construction project timeline by the end of January 2019. Currently, soil testing and sight inspection is underway, with design 85 percent complete. School officials intend the new career center to expand programming in robotics, cyber security, drone technology, manufacturing and engineering technology after the career center conducted a study and found the need for more local education and training in those fields. Students will move into the new building in August 2020 for the start of the school year. A few more stories were significant to the county that didn’t make the Top 10, including the county experiencing a high number of flu hospitalizations; the debut of the sheriff’s office’s newest K-9, Auco, in June; new development in the Beaver Valley Shopping Center; and most recently, Clifton Mill winning ABC’s Great Christmas Light Fight and long-time County Engineer Bob Geyer announcing his retirement. https://www.xeniagazette.com/wp-content/uploads/sites/32/2019/01/web1_Courtroom-2.jpgFile photos Attorney Gardner Combs speaks on defendant Matthew Bolen’s behalf July 27. Leah Lind, her dog Willow, and supporters sit behind them. https://www.xeniagazette.com/wp-content/uploads/sites/32/2019/01/web1_JailMeeting-2.jpgAnn Poortinga, Layh & Associates (left); Renee Pinkelman, Layh & Associates; BOCC Risk Management Director Lisa Hale; County Administrator Brandon Huddleson; Commissioner Alan Anderson; Commissioner Tom Koogler; Melissa Walters, Greene Leaf Program; Michele Cox, Women’s Recovery Center; Tom Otto, TCN Behavorial Health Services; Lori Strobl, TCN; Nathan Crago, TCN; Greta Mayer, Mental Health and Recovery Board (not pictured) and Sheriff Gene Fischer meet April 24 to discuss needs for a new jail. 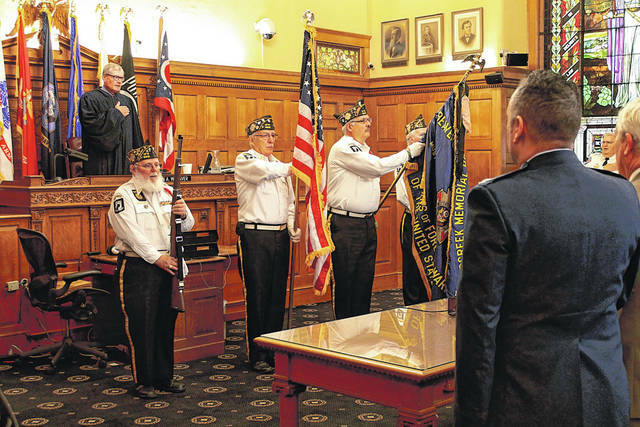 https://www.xeniagazette.com/wp-content/uploads/sites/32/2019/01/web1_Pledge-2.jpgA dedication ceremony was held for the new veterans’ court in Greene County Common Pleas Court in November 2017. The specialized court, in action as of April 6, gives a hands-on approach to helping veterans through the criminal justice system. https://www.xeniagazette.com/wp-content/uploads/sites/32/2019/01/web1_Courthouse-2.jpgA series of Gazette stories chronicled three county judges’ dispute over a third courtroom in the courthouse. 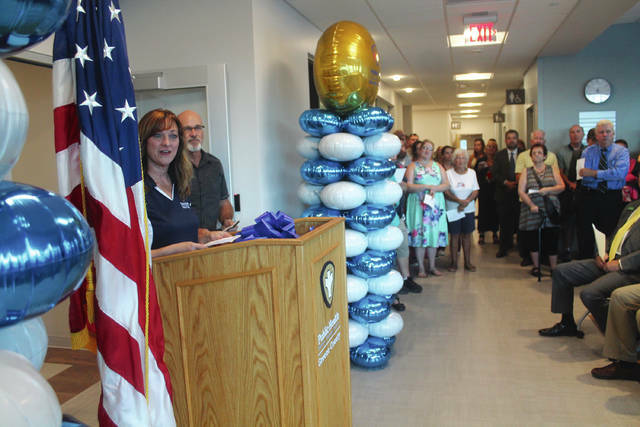 https://www.xeniagazette.com/wp-content/uploads/sites/32/2019/01/web1_Howell-2.jpgHealth Commissioner Melissa Howell addresses a crowd during the grand opening ceremony of Greene County Public Health’s new facility Aug. 13.
https://www.xeniagazette.com/wp-content/uploads/sites/32/2019/01/web1_Cover-2.jpgThe Xenia Daily Gazette celebrated 150 years Aug. 18. Staff created a special Honor History section to honor the paper’s birthday and local history. https://www.xeniagazette.com/wp-content/uploads/sites/32/2019/01/web1_DSC09672-2.jpgThe REACH Center on Progress Drive was open for hard hat tours Oct. 20. 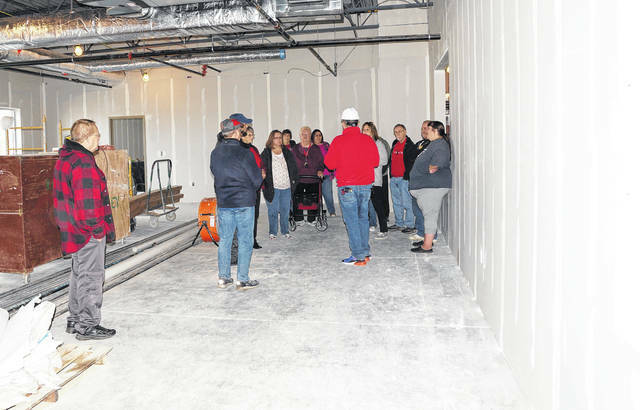 Visitors saw the building, a collaborative project with Clark State, Xenia, Kettering Health Network, the YMCA of Greater Dayton, Central State and the Adult Recreation and Services Center, which will open in January 2019.
https://www.xeniagazette.com/wp-content/uploads/sites/32/2019/01/web1_DustinAttorneys-2.jpgDuring his plea hearing Sept. 12, Dustin Merrick, 27, center, glances at a note from his attorney, Kirk McVay. Defense Attorney Gregory Meyers watches the interaction. The older Merrick pleaded guilty to murder charges following the January 2017 shootings of William “Skip” Brown and Sherri Mendenhall. He avoided the possibility of the death penalty, but will spend life in prison. https://www.xeniagazette.com/wp-content/uploads/sites/32/2019/01/web1_deskins-2.jpgGreene County Career Center Superintendent David Deskins, pictured March 22 on campus, anticipates students to move into the new career center in August 2020.
https://www.xeniagazette.com/wp-content/uploads/sites/32/2019/01/web1_BretAttorneys-2.jpgBret Merrick, 25, center, listens to his attorneys during sentencing in Common Pleas Sept. 12. Defense Attorneys Michael Pentecost, left, and Dennis Lieberman represented him. The younger brother, who accompanied Dustin Merrick at the crime scene, pleaded guilty to involuntary manslaughter and was sentenced to 25 years in prison. Scott Halasz contributed to this story.